Fistful of Kicks mashes up all your favourite kung fu movies of yesteryear into a wild and exciting improvised comedy. Featuring some of Vancouver's finest Asian-Canadian improvisers, this show infuses longform storytelling with exhilarating stage combat for a truly unforgettable show. 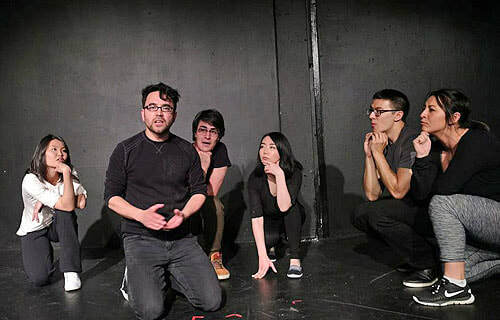 We've prepared two brand-new formats inspired by traditional East-Asian folklore just for the Seattle Festival of Improv Theater -- come on out for both shows! Fistful of Kicks has been kicking metaphorical and literal butts on stage since March 2017. We are an eclectic group of improvisers from around Vancouver but we all call Instant Theatre home. Instant Theatre Company has been producing improvised comedy since 1994. As the home of theatrical improvisation in Vancouver, Instant strives to create productions that are artistically challenging and unequivocally hilarious.